Manual medicine is the use of hand manipulation and directed techniques to aid in the diagnosis and treatment of musculoskeletal disorders. Manual medicine is based, in part, on the belief that man is a self-regulating being. Because of that the body, when in normal structural relationship, is capable of self-healing and defense against disease. The goal of manipulation is to restore optimal balance and pain free movement. The treatment modality is employed by chiropractors, massage therapists and physical therapists, alike. 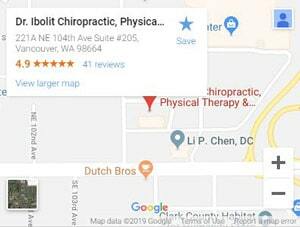 Dr. Ibolit Chiropractic, Physical Therapy & Massage offers all three types of Manual Medicine in Vancouver, WA. Manual medicine is as old as medicine itself. It was practiced in Thailand 4,000 years ago and used in ancient Egypt. Hippocrates, the founder of modern medicine, used traction and leverage techniques to treat spinal disorders. In the 19th century “bone setters” were popular in Europe and the United States. Dr. Edward Harrison, in 1784, Andrew Taylor Still, in 1874, and D.D. Palmer, in1895, began what is known today as manual medicine, Osteopathic medicine and Chiropractic respectively. Manual medicine diagnoses are made by chiropractors, massage therapists and physical therapists using a wide breadth of factors. A comprehensive history, detailed and specific physical examination (including Osteopathic, orthopedic, neurologic, rheumatologic and Chiropractic exams), and appropriate radiologic studies all aid in diagnosis. The use of hands to manipulate specific parts of the body allows practitioners to find alignment issues, range of motion abnormalities of mobility, tissue texture changes, circulation of fluids and energy. Manual medicine techniques are used to diagnose, treat, and prevent illness or injury. A practitioner moves a patient’s muscles and joints using techniques that include stretching, gentle pressure and resistance. It is no secret that traditional medicine and chiropractic theories and practices have no always aligned. While traditional medicine may still focus on a pharmaceutical treatment modality, and chiropractic a much more holistic approach, the two fields have come to agree on one thing. Manual medicine is an effective means of healing. Physical therapists have helped bridge that gap. While they are separated from other health practitioners because of our hands-on approach, their skills are often used to further traditional healing processes. Hands-on skills include: targeted stretching, joint mobilizations, massage/soft tissue mobilization, trigger point release work, and guided strengthening and muscle re-education. All to aid in allowing the body to move properly and without pain. At Dr. Ibolit Chiropractic, Physical Therapy & Massage, therapy sessions will focus on having the you involved in your care. Exercise empowers you to be in control of your symptoms. After a thorough examination, your therapist will build you a custom program of exercises. To target specific muscular strength and mobility imbalances you may have. 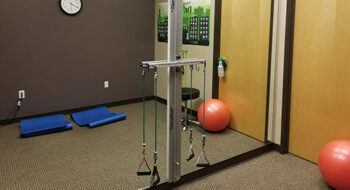 Your therapist is Certified in Applied Functional Science and will get you back to work and play in no time.